At the end of 2007, a news article stating that the paraxylene (PX) project in Xiamen may be relocated has drawn much public attention. Behind the good news was the benign interaction between the public and the government that included governmental opinion mixed with public opinion and also some symposiums on environmental protection. The PX project in Xiamen is a win-win game for both the government and the public. The project showcases a special phenomenon: orderly public participation in politics. Chinese people do not cozy up to the word "citizen". In the past the word held a political and legal connotation. Nowadays the word has become more familiar to them due to orderly political participation. "We must ensure that all power of the state belongs to the people, expand the citizens' orderly participation in political affairs at each level and in every field." In this way the political report to the 17th National Congress of the Communist Party of China (CPC) which was held in October 2007 has upgraded the level of the orderly public participation in politics. It seems natural to see the term of "citizens' orderly participation in politics" appearing in the Party's political report now. But history tells a different story. During most of the long history of the Chinese nation, no freedom or equality was given to the general public. Fortunately, after opening up to the outside world, enhanced by societal development and the process of governing the country by the rule of law, the rights and obligations of the citizens have been secured. Citizens have become more enthusiastic toward political participation. The PX project in Xiamen is a typical example. The precondition of orderly political participation is that citizens must have a sense of democracy, equality, freedom, justice, and reciprocity regarding rights and obligations. 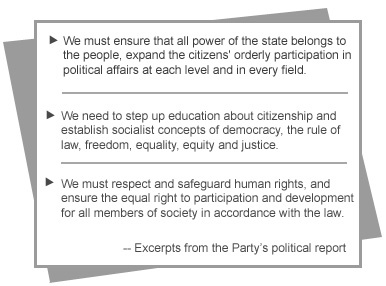 The 17th Party congress claimed to strengthen the education of every citizen's sense of democracy, equality, freedom and justice. Professor Li Lulu, Director of the Sociology Department at Renmin University of China, thinks that citizens have inviolable rights; for example, the right to know, the right to participate, the right to express and the right to supervise. At the same time they must shoulder any obligations related to these rights. From the perspective of these rights, Li thinks that in order to build socialism with Chinese characteristics, the most important thing is to motivate creativity and positive thinking among citizens by protecting the rights of the citizens. The most important basis to construct a harmonious society is to respect and cherish the rights of the citizens. Fortunately, we are now witnessing rationality and maturity regarding political participation among ordinary folks. "I want to speak." "I don't agree with your idea." Eleven representatives debated furiously during a hearing that discussed the management of special funds for home repairs in Jiangsu Province on December 18, 2007. Not long ago, the State Council solicited public opinion regarding the adjustment of public holidays. The public enthusiastically expressed their opinions via the Internet. In the past, the public would never have imagined that they had the right to speak and suggest policies and rules closely related to their daily lives. In recent years, China has strengthened the building of several systems: the System of the People's Congress, the System of Multi-parties Cooperation and Political Consultation, the System of National Regional Autonomy and the Villagers' Self-government System. The public now has a bigger platform for political participation. In recent years, the administrative bodies at all levels have established the Press Spokesman System to disclose the whole process of major policies and decision making to the public. Currently, more than 70 percent of the county-level governments have established a Public Opinion System. They hold public hearings, advisory meetings and panel discussions to solicit public opinions concerning proposed law drafts. The state moves further forward to open communications channels, inviting the public to voice their concerns. Officials post public notices about weighty matters such as governmental personnel displacement and administrative fee-charging standards, thus keeping government affairs under close public scrutiny. Currently the central and local governments are making an energetic stab at Internet construction, pooling public voices and opinions more effectively and widely. However, many factors such as an imperfect political system and limited communication channels and erroneous concepts embraced by some leaders are now putting a damper on these democratic attempts, We must step up the improvement of social management and political construction. The year 2008 will see more guaranteed access to information. The Regulations on the Release of Government Information will go into effect as of May 1, promoting the transparency of policies concerning governmental affairs and public interests. Personnel reshuffle in the National People's Congress will take place in 2008. A host of credible delegates will be selected to participate in the congress on behalf of 1.3 million Chinese. In the near future, 100 million migrant workers across the country will also be represented in the National People's Congress in order to fulfill their political aspirations. The year 2008 will teem with a series of edicts that serve public interests. For instance, the Employment Contract Law, the Regulations on Paid Holidays and the Employment Promotion Law will all go into effect this year. Moreover, revised Regulations on Legislation Procedure for the Gansu People's Congress went into effect as of January 1, allowing the public to suggest legislation and participate in drafting laws. "This regulation has broken much ground in public political participation by legally stipulating public rights regarding legislation," said Yang Xingchang, Director of the Law Committee under the Gansu Provincial People's Congress Standing Committee.